Different kinds of traumatic events and violence can impact the behavioral health of individuals, families and communities. Trauma can result from a major accident or disaster that is an unintentional result of a man-made or natural event. Disasters can occur naturally (such as tornadoes, hurricanes, earthquakes, floods, wildfires, mudslides or drought) or be human-caused (such as mass shootings, chemical spills or terrorist attacks). School violence is violence that occurs in a school setting and includes, but is not limited to, school shootings, bullying, interpersonal violence among classmates and student suicide. Youth violence is a serious problem that can have lasting harmful effects on victims and their families, friends and communities. 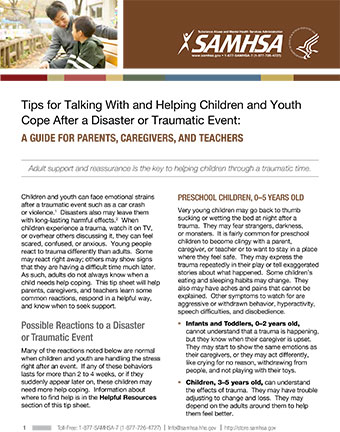 Resilience guide for parents and teachers » from the American Psychological Association. Building resilience – the ability to adapt well to adversity, trauma, tragedy, threats or even significant sources of stress – can help our children manage stress and feelings of anxiety and uncertainty. However, being resilient does not mean that children won’t experience difficulty or distress. Emotional pain and sadness are common when we have suffered major trauma or personal loss, or even when we hear of someone else’s loss or trauma. 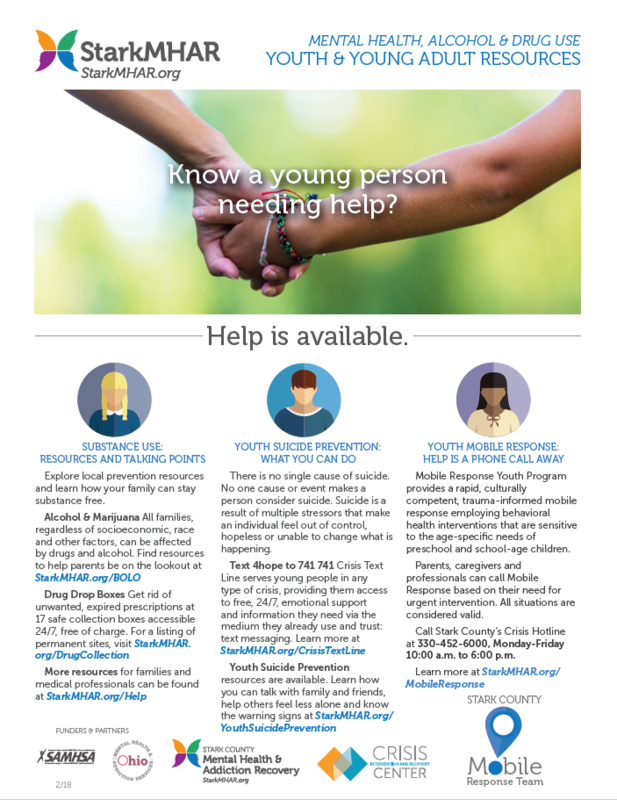 A national tragedy: Helping children cope » Tips for parents and teachers from National Association of School Psychologists. Whenever a national tragedy occurs, such as terrorist attacks or natural disasters, children, like many people, may be confused or frightened. Most likely they will look to adults for information and guidance on how to react. Parents and school personnel can help children cope first and foremost by establishing a sense of safety and security. As more information becomes available, adults can continue to help children work through their emotions and perhaps even use the process as a learning experience. Mental Health Response to Mass Violence and Terrorism: A Field Guide » Guides disaster response workers in assisting survivors and families after mass violence and terrorism. 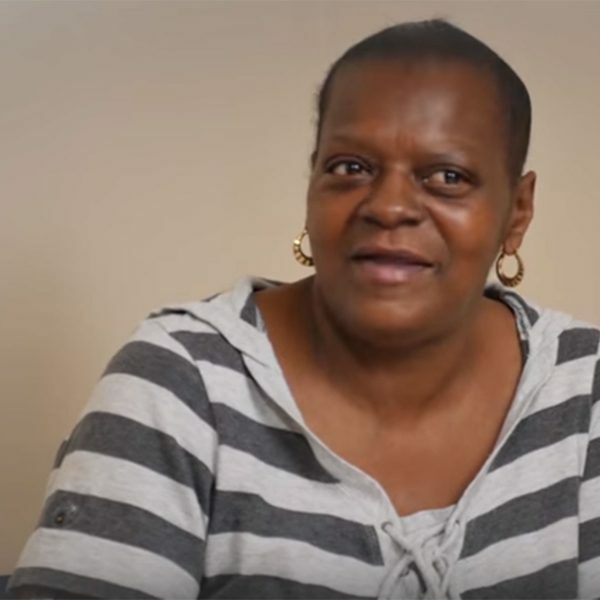 Discusses basic counseling skills, when to refer to mental health services, populations with special needs and stress-coping strategies for workers (SAMHSA). Mental Health Response to Mass Violence and Terrorism: A Training Manual » Guides mental health professionals in building an emergency preparedness program to respond to mass violence and terrorism. Includes background information, key concepts in mental health intervention and guidance for setting up a training course (SAMHSA). Preventing Suicide: A Toolkit for High Schools » Assists high schools and school districts in designing and implementing strategies to prevent suicide and promote behavioral health. Includes tools to implement a multi-faceted suicide prevention program that responds to the needs and cultures of students (SAMHSA). Community and School Violence Reading List » Compiled by experts in the National Child Traumatic Stress Network. It includes important recent work as well as classic books and articles on community and school violence by Network and other experts in the field. Developing Cultural Competence in Disaster Mental Health Programs » Gives background information, guiding principles, recommendations and resources for developing culturally competent disaster mental health services. Includes suggestions for working with refugees and guidelines for using interpreters (SAMHSA). Disaster Behavioral Health Preparedness and Response Resources » Lists disaster preparedness and recovery resources for range of professionals who assist individuals and communities in coping with disaster. Topics include emergency preparedness, training, disaster response, stress prevention and management and suicide prevention (SAMHSA). Psychosocial Issues for Children and Adolescents in Disasters » Offers resources for those working with children in the wake of disaster. Discusses theories of child development as applied to a youth experiencing the fear, anxiety and trauma of disaster. Offers practical suggestions, case studies and a resource guide (SAMHSA). A Guide to Managing Stress in Crisis Response Professions » Aids crisis response workers in stress prevention and management before, during and after a public health crisis. Describes the stress cycle and common stress reactions. Offers tips to promote a positive workplace and to monitor and minimize stress (SAMHSA).